My design wall this morning is crowded. Lots of things waiting for me to play with them. No new liberated baskets this past week. My bird and leaves from last week are still waiting to be sewn down- but I have picked out the thread. This week's string block is that blur you see beneath the baskets. This is the 'designing' part for this week. I am almost done making these string blocks. I have placed the final red choice in the centre of the top 4 blocks. I am making 6 blocks and hoping to cut them to fit this stocking. They will be the front. I think I will be using one piece of fabric for the back. I'm getting a little concerned the strings will be heavy, so I've decided to just use the strings and their foundations as the front piece. Inside the stocking will be messy, but I think I'm going to add a lining so you won't see it. Most of this week will be spent finishing quilting Sadie's quilt. Another busy week here filled with lots of projects and ideas. 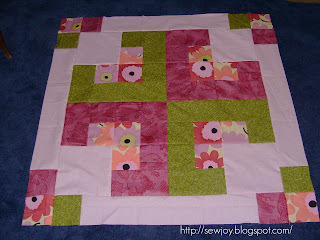 Check out some more design walls through the links at Judy's Patchwork Times. Of course we can see the hearts! Neat design! I really like the photo of the design wall with the sun shining on it! I see hearts. Neat idea. Your wall is a busy place. The string blocks on the stocking will be nice for Christmas and you are working on it in plenty of time. I see the hearts too. Please show the finished swag quilting on it.